Unchanged Land, Exploring the Horizon of a Tangible Myth: ‘Explorer’. For ‘Unchanged Land, Exploring the Horizon of a Tangible Myth’, I photographed the Ice Landscapes in Finse, an almost abandoned location in Norway. Polar explorers Robert Falcon Scott, Roald Engelbregt Gravning Amundsen and sir Ernest Shackleton once used this location to test their equipment because its conditions closely resemble those of the South Pole. The installation ‘Unchanged Land, Exploring the Horizon of a Tangible Myth’, presents landscapes that have barely changed since they where first visited by famous explorers. A museological display refers to the reality of these explorers from the past. At the same time, the modern presentation clarifies the contemporary nature of most elements of the exhibition. Visitors entering the room can hear a soft humming of an airconditioner wich doesn't only support the museological atmosphere, but also brings a little chill in the air, making it easier to connect with the idea of exploring the frozen environment depicted. I photographed the landscapes specifically for this work in Finse. To show them in the most realistic way possible, I created Lightboxes for some of the images. I made a setup in front of a large landscape photograph where visitors can listen to an audio work while watching the landscape. The story is my own but can also be understood as the universal story of an explorer. The cinematographic setup invites to become immersed by the narration. 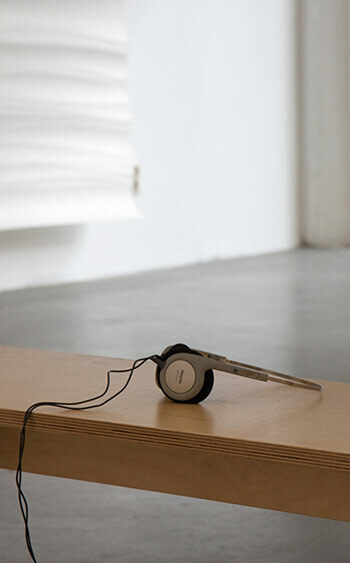 Exhibitions: Sprouts #1; Dutch Art Academy Selection, Galerie 59 and Gerrit Rietveld Final Exam. Unchanged Land, Exploring the Horizon of a Tangible Myth: ‘Ice Landscape’. Unchanged Land, Exploring the Horizon of a Tangible Myth: audio work ‘If I were a Rock’. ‘There was a time I could revel in past accomplishments. Thinking I had been there and done that and knew it all. I was satisfied building small variations on top of old structures in my mind. I had only seen the world from behind the blinding window of a screen.The power window of an new car, the uv protected windows of my sunglasses. I didn’t have a clue. To smell the air, to feel the surface, to taste the water, to see endlessly ahead. Not knowing where nothingness ends. To feel abandoned. Even though I was the one leaving. From this point on, turning back is no option. The distance I covered may very well be longer than what lies ahead. Besides that, it is the thought of moving forward that keeps me going. If I were a rock, I could sit there for a thousand years and never get restless. I would then enjoy the same majestic landscape through every possible angle of light, over and over again. Not wondering what is beyond the facade of this wonderful scenery. If I just sit here and ingest every millimeter of this panorama, it shall in return devour me. I will become rock. I will become earth, I will have a home forever. The cold creeps upon me slowly but with vigorous persistence. I am bound to keep going, even though there is nothing out there. No glory, no reward. Unchanged Land, Exploring the Horizon of a Tangible Myth: transcription ‘If I were a Rock’. Unchanged Land, Exploring the Horizon of a Tangible Myth: salt from Timbuktu. The designation of landscapes often refers to a Narrative. The name of the ‘Taklamakan’ desert literally means ‘Step inside and never return’. In ‘Unchanged land, Exploring the Horizon of a Tangible Myth’ I create my ‘Myth’ by exhibiting unmanipulated images and objects that originate from the natural world. Because of the authenticity of the elements, viewers can relate to the world they came from. It is, for example, important that the salt crystals I show, actually originate from Timbuktu, and that I was a personal witness of the existence of the landscapes by photographing them myself. Another element of the exhibition is an almost antique world atlas with the routes of explorers drawn in. Landscapes visited by Marco Polo, George Laing and David Livingstone are presented through a slide show, alternating text and images. The text highlights narrative elements of the names of landscapes. For example ‘Taklamakan’ (a desert once described in the journals of Marco Polo), literally means ‘Step inside and never return’. 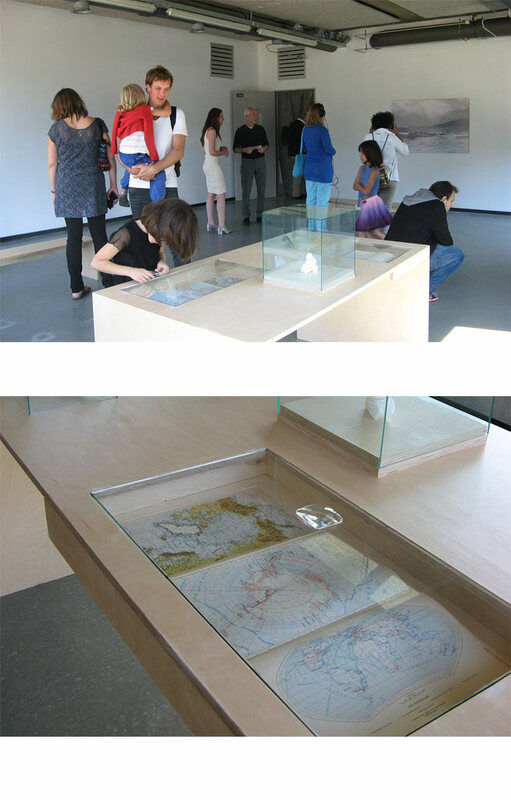 Unchanged Land, Exploring the Horizon of a Tangible Myth: presentation table. 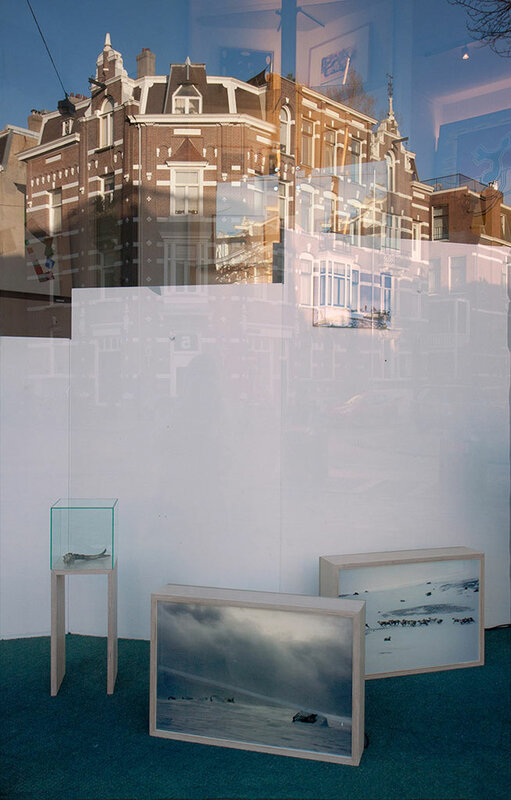 Unchanged Land, Exploring the Horizon of a Tangible Myth: Lightboxes ‘Rocks’ and ‘Wild Reindeer’.